On 19th August 2013 a new volume will be added to the BFI's best-selling series of transport and travel films, The British Transport Films Collection. Marking London Underground's 150th anniversary, Experiment Under London, Volume Eleven in this series of double-DVD sets, presents six films documenting the construction of the Underground's Victoria Line, which were produced by the BTF Unit for London Transport. During the Autumn of 1962, engineering work began on the first new underground railway to be built under Central London in over sixty years. Made between 1961 and 1969, the six films show, in meticulous detail, the mammoth undertaking of building the Victoria Line, one of the most complex civil engineering projects that London had ever seen. It was officially opened by the Queen in March 1969. After an initial film showing the proposals and the tunnelling technology that will be used, the other five films are Cine-gazette style reports that not only show the technical engineering achievements but also the human endeavour required from the workforce and the cooperation of the public. This digitally mastered collection, which is accompanied by a booklet of film notes, is a must, not only for the transport enthusiast, transport workers and engineers, but also for documentary aficionados and anyone interested in Britain's industrial history. The British Transport Films Collection, Vol. 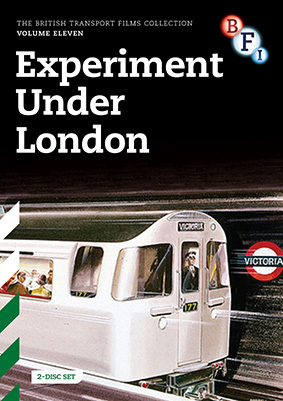 11: Experiment Under London will be release as a 2-DVD set on 19th August 2013 by the BFI at the RRP of £19.99.